What are SAP Streamwork and SuccessFactors JAM? They both are part of SAP Social Software. They both provide environments for enterprise collaboration between workforce to drive cooperation while sharing data. SuccessFactors JAM - Is social networking collaboration platform within enterprise from SAP. Basically it is kind of “facebook” type of thing platform for enterprises. It enables collaboration of employees between companies and their partner companies while they all work on joint projects sharing applications, processes etc. Features of the platform span from discussions, notifications, follow-ups, creating (micro/blogging, wiki), and sharing content, organizing, tasking, learning and all it is provided in “feed updates” like user interface. Main goal is to engage workforce and boost their performance. The Jam platform supports mobile devices in large extend. From its competitors point of view we can say that JAM is like Microsoft’s Yammer. Jam got into SAP’s portfolio while they acquire SuccessFactors in 12/2011. SAP Streamwork – then there was Streamwork. It (was)/is solution homegrown in SAP. We can say that it has broader scope then SuccessFactors JAM due to a lot of integration to SAP’s backend systems like ERP, CRM, SRM, BW. And that’s one of main powers of Streamwork – integration. So guess what happened during 2012 while SAP was integration SuccessFactors as its daughter company. They integrated both products into one as well. It is called SAP JAM as their platform for social software. The JAM’s underlying platform seems was taken from SuccessFactors while a lot of features from Streamwork were built into it. PS: SAP started to evaluate SAP Jam platform also for their Massive Open Online Course (MOOS) initiative open.sap.com. The very first course utilizing Jam platform is rapid implementation of Predictive Analytics with SAP HANA. Just updating few more details how SAP started with SAP Streamwork. Initially it was called as collaboration software previously known as 12sprints and/or Constellation. There was also Elements application as next Enterprise 20 tool. All these finally merged into Streamwork. Needless to say that all these initiatives were aiming as competition to Google‘s Wawe. During its development the 12sprint (collaborative platform) was open to users through a public beta. The 12sprint cloud-based service is designed to help teams of internal and external users share information, collect feedback, brainstorm or analyze across the group. History knows it that Google Wave was shouted down in August 2010. And SAP’s Streamwork was ended on December 1, 2015 but replaced by SAP Jam. Recently I worked on few installations of SAP IDES systems. In this post I’d like to sum up important information on the IDES systems. In general the IDES is demo system of SAP software. IDES means International (or Internet) Demonstration and Education System and basically it models artificial company SAP Model Company or BestRun (e.g. company code 0005- 0005) who choose to implement SAP. The system has already a lot of customization and data available right away after its installation. How the customizing/data were basically prepared? The system is copy of SAP’s internal demo system. As it is used for demo and training purposes also by SAP there are many preconfigured clients with the data. What about new version? Can I upgrade my IDES? There are no specific patches (support packs - SP) for IDES. However manual patching with SP form regular releases for particular solution may be possible. *-- fill table "MONITOR" with values of structure "MONITOR_REC"
* raise exception type CX_RSROUT_ABORT. This would suggest that: if data is declared in the 1st area then the data is available across all datapackage. If the same is declared in the 2nd area then the data is only available for the actual package. But this may not be really true. Let’s see what else we can say about first two. 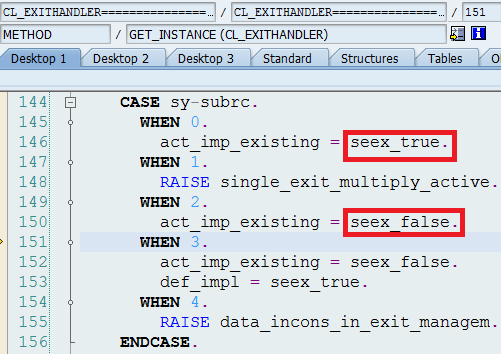 One of theories to solve this can be that 1st area is used for data declaration according ABAP OO paradigm. 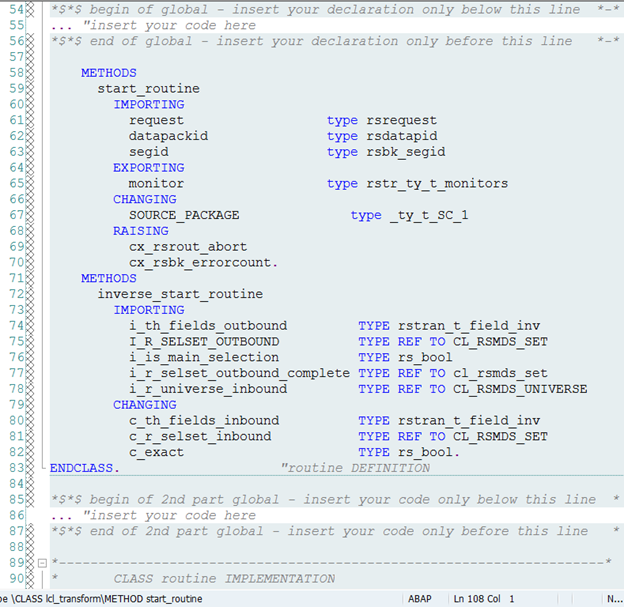 2nd one would be used for data declaration of pre-OO (or non OO) ABAP standards. But this again may not be true. In the first global part you can write your declaration or code you want to be able to reach globally in the transformation. The 2nd global part will be used for those transformations which are migrated from an update or transfer rule. Routines used there will be automatically generated into the 2nd global part. 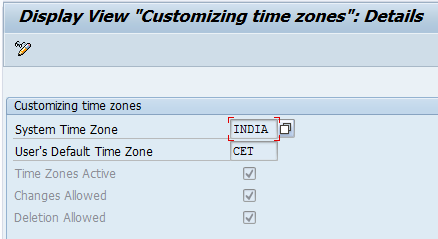 Time zone of SAP system is very important settings. When we compare particular times it only makes sense when all compared times are in the same time zone. SAP system would normally inherit time zone from operating system. However it can be customized in TA STZAC. Particular value of time zone customized in this TA is valid for all system’s clients. Once system time is customized all conversion to e.g. local time of user or conversion to any other time zone are done by converting of system time to UTC and then to desired time zone. INTO TIME STAMP time_stamp TIME ZONE tz. [TIME tim] [DAYLIGHT SAVING TIME dst]. Are using such a conversation. Notice that time zone for those ABAP statements need to be defined as type of TZNZONE which refers to table TTZZ for possible values.